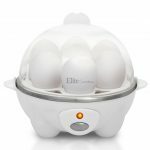 Cuisinart Egg Cooker Review: If you eat eggs daily and are on the lookout for new ways of preparing your eggs then the Cuisinart CEC-10 Egg Cooker could be the gadget you have been looking for. 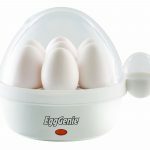 This egg cooker has a maximum capacity of 10 eggs, which is great if you are cooking for a large family. At the time of writing this review the price of the Cuisinart Egg Cooker was $34.99. Prices do change on a regular basis. CLICK HERE to see the latest price. 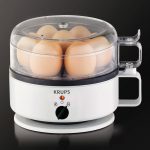 Cooks 10 eggs – Cooks 10 eggs in shells to a hard, medium or soft consistency with the 600-watt heater. 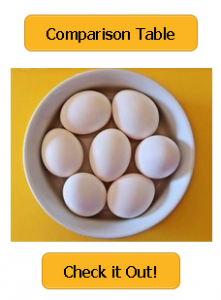 Poaching Tray – Poaching tray with 4-egg capacity and omelet tray with 3-egg capacity. Measuring Cup – Cooker includes a 180 ml measuring cup with piercing pin. Cord Storage – Built-in cord storage allows for easy cleanup. Easy to clean – The base is constructed from stainless steel so is easy to clean after use, try to use distilled water when cleaning the base. A standout feature of this cooker is how it makes use of its innovative two-tiered cooking system to cook ten eggs at the same time. SAVING you precious time. Like similar kitchen appliances a user will be able to cook eggs to a hard, medium or soft consistency. 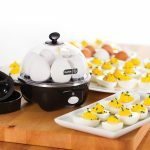 The Cuisinart Egg Cooker is supplied with removable trays that have been designed to poach eggs and make omelettes. The Cooking cycle time is controlled precisely by the level of water added to the unit. Using the supplied measuring beaker you can fill the cooker to the appropriate level and the pour water into cooking plate. To guard against overcooking the Cuisinart egg central cec-10 has a built-in LED light, audible alert, and standby mode. When you open the box you should have the cooker base, an egg tray, omelette tray, measuring cup, poaching tray and a lid. The measuring cup comes with markings on the side related to they type of eggs your cooking from soft boiled to omelettes. Make sure you don’t lose the measuring cup. On the base of the up is a small piercing. Plug the power cord into a power point. Using the measuring cup fill the base with the required amount of water to cook the eggs you would like. Place the egg cooking tray onto the base. Now its time to get the eggs ready. Using the piercing tip on the base of the measuring cup pierce the eggs on the narrowest side. Place the eggs into the holders on the tray, ensuring the pierced side of the eggs are facing upwards. The tray can hold seven eggs. If you want to cook 10 eggs, at this point you will have to use the second egg base picture below, it will sit on top of the first seven eggs. Place the lid onto the cooker. On the front of the cooker you will find an on/off switch. Turn the cooker on and when you hear the buzzer the eggs will be cooked. When poaching eggs ensure you use some non stick oil before loading the eggs into the tray to ensure they come out easier at the end of the cooking cycle. When poaching or cooking omelettes the individual trays will sit on top the egg cooking tray that can hold seven eggs. 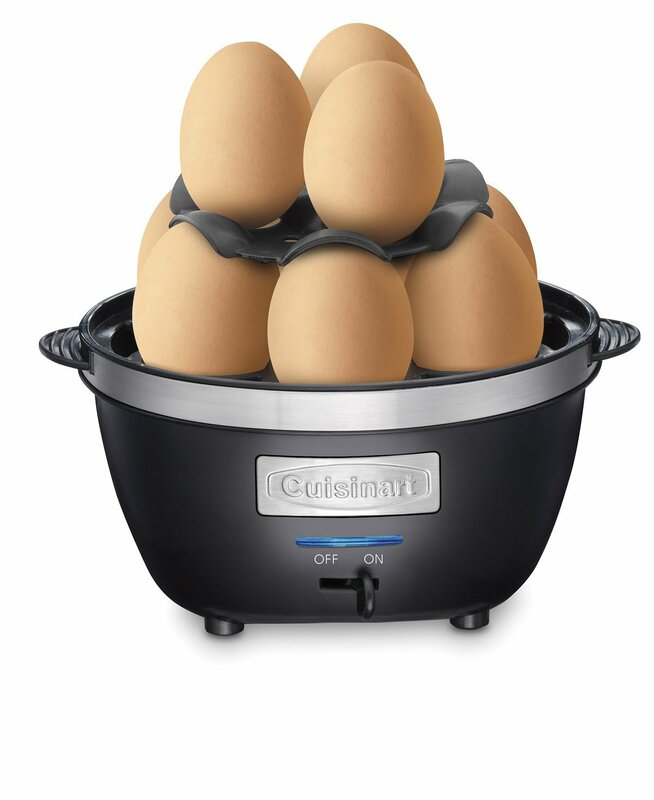 Most users are very pleased with the Cuisinart CEC-10 Egg cooker. Users say that it cooks poached eggs perfectly, every time. They also like the fact that the unit comes with handles that you can use to lift the lid without getting burned. Users love the fact that this cooker is easy to clean once a cooking cycle has finished. “For people who love eggs everyday but have limited time. This is a fun and practical gadget. Easy to use, easy to clean. Follow the very simple instructions…SERIOUSLY! If it says use cold water, use it! If it says to position the egg a certain way, do it! Then the eggs will be perfect every time!! Love this thing!!!! Great buy!! 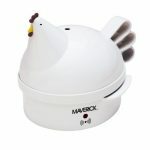 “This is so much better than the older style egg boilers. They make perfect eggs every single time. 10 eggs. Perfection. The omelette maker is amazing. The poached eggs are beautiful. Our grandson made 20 eggs & tried to eat them all so he could make more. Love this thing!!!! Great buy!! It would be an awesome gift. How long does it take to cook a batch of eggs? Should I user distilled water? Using distilled water does make the cleanup easier. How many eggs can you poach at once? You can poach up to 4 eggs in one go. Does it come with an auto shutoff? No, the unit will beep loudly at the end of a cooking cycle until you manually turn it off. Does it work at 220V? The Cuisinart CEC-10 Egg Cooker is a super compact kitchen appliance! It is easy clean up and simple to use. Also it is nice to be able to cook ten eggs at a time. Make all of the eggs needed at one time and in a fraction of the time it takes to boil them. When looking into user reviews and opinons the Cuisinart CEC-10 egg central egg cooker does very well. It has been been reviewed by over 800 customers on Amazon at the time of writing this review and has a user rating of 4.5 stars out of 5.0. Has a large 10-egg capacity, perfect for a large family. The buzzer is loud so you can get on with other work. Compact so it won’t take up a lot of cupboard or counter space. Hard Boiled eggs are extremely easy to peel. There is no auto-shut off feature but the beeping that comes at the end of the cooking cycle is fairly loud. Some users have complained that the appliance leaks water during a cooking cycle. It appears that this can happen if the instructions are not followed to the letter. In many cases it is caused by not ensuring the eggs have the top end in the correct direction and pierced.